Jamie Bovay, DPT, MTC, CSCS graduated with a Doctorate in Physical Therapy from Rockhurst University in Kansas City, Missouri. He has worked with athletes at all levels including professionals, Olympians, weekend warriors, kids, and everything in between. 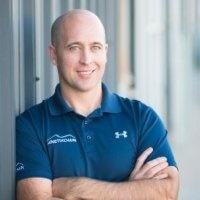 He uses a combination of manual therapy, joint manipulation, dry needling, instrument assisted soft tissue mobilization, taping, corrective exercises, and other techniques to get his patients better as quickly as possible. Using this approach has not only been extremely effective for athletes from all sports, but also for everyday orthopedic injuries as well. Through a wide variety of continuing education and self-learning Jamie has always striven to improve. In his quest to improve he attained his Manual Therapist Certification (MTC) and is a Certified Strength and Conditioning Specialist (CSCS). These skills and qualifications have allowed his patients to receive excellent results and outcomes making him one of the most sought out PT’s in Denver. Growing up playing a variety of sports he still plays basketball frequently and you can find him in the mountains most weekends hiking/trail running in the summer or snowboarding in the winter.